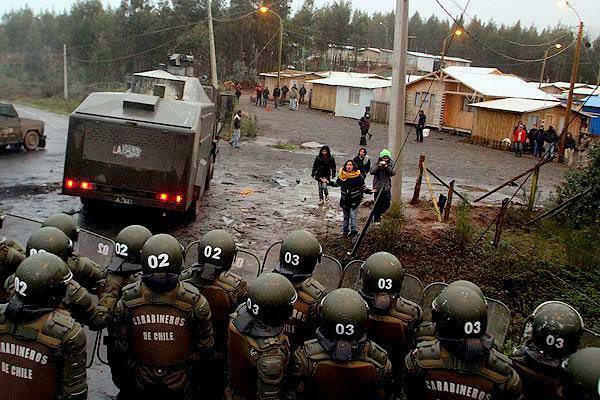 Chilean riot cops raid Mapuche community. Neoliberal governments, like their economies, need certain commodities in the course of their development with the ends to consolidate, improve and deepen their dynamics, which may not necessarily be easy for the elites. This is why they build stories that empathize with people’s needs, with its deep and heartfelt demands, fill solutions in the framework of populism, but under no circumstances promote participatory processes where the model is questioned and new cultural and economic practices are generated. The deepening of State paternalism and the welfare arm is what is sought out, and of course the perfection of persecutory and repressive tactics. Who questions this model will be persecuted, and who manages qualitative progress in that direction and deepens practices to decolonize our work, advocating own identity and history, will be imprisoned, repressed or killed. That is the dichotomy of this model; on the one hand it offers a sort of paradise, nonexistent, for clients of this dynamic development, and the other chases and stigmatizes you as a terrorist. The main premise is that obedience is a virtue of the “good” Mapuche, and the proclamation of a national liberation project and its proverbial self-defense are by definition practices of “bad” Mapuche. Unto the statements made by Mr. Peñailillo, Minister of the Interior, commenting on the existence of an expert commission with the purpose of making profound, perfecting, and modernizing changes to the Anti-Terrorist Law (whereby amendments are due to pass in Congress within the next 60 days); we wish to share an opinion piece by Mapuche Political Prisoner, Héctor Llaitul of the CAM for reflection, which may also allow us to take a position on the matter. The current Anti-Terrorism legislation (Law No. 18,314) is a legacy of the military dictatorship. It was in 1984 that the military junta decreed its existence in order to pursue and annihilate opponents. Within the legislation terrorist actions such as kidnapping, destruction of aircraft, assassination attempts, bombings and poisoning water were included, among other things. Arson was then subsequently included in 1991, in the “democratic” era. As has already been amply recorded, this law led to countless acts of human rights violation during the period of the dictatorship. In turn, it was used again in the early years of the Centre-Left coalition governments of “La Concertación” within the democratic era, which sought to diligently pursue and annihilate the subversive groups that held political-military strategies and, subsequently, was to be applied against the autonomous Mapuche movement. 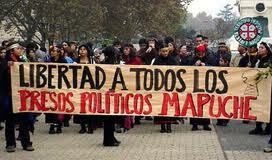 Mapuche protest in support of their political prisoners. However, we should point out that once the Mapuche movement began to rise with strength, the first repressive measures that were imposed were other laws and jurisprudence, such as the State Security Law (Law No. 12,927), created in the 50s and reformed and perfected during the dictatorship as a repressive mechanism for political control. It is with the introduction of criminal procedure reform and pressure from business groups that the legal arguments for the use of the Anti-Terrorist Law against the Mapuche cause strengthened, because it was much more punitive and with a greater repressive reach than any other common law used within the Civil Code. Its debut came in 2002, when the first charges were laid by the government of Ricardo Lagos, which resulted into two separate investigative charges laid against the Arauco Malleco Coordinator of Mapuche Communities in Conflict (Coordinadora Arauco Malleco – CAM). One, which had more resonance in Region IX, known as Illicit Terrorist Association and the immediate consequence was the arrest and imprisonment of twenty Mapuche activists and leaders such as La Chepa [Patricia Troncoso], Llaitul, Norín, Huenchunao, Pichún, among others. Meanwhile, as a result of the Anti-Terrorist law being invoked by local authorities, which included the role of Rodrigo Peñailillo (then governor of the Province of Arauco), another investigation was initiated in the Court of Cañete that led to the charge of Illicit Terrorist Association against CAM, but this time in Region VIII. Both cases followed their own courses, but ultimately did not succeed, as the arrested Mapuche community members were dismissed and the accused acquitted after spending more than a year in prison. The cases where there were convictions based on the Anti-Terrorist law were as follows: the case of the Loncos [Chiefs] (Pichún and Norin), the Ancalaf case and Poluco-Pidenco case, all of which had anywhere between 5 and 10 year convictions. During the last period of Ricardo Lagos and throughout the government of Michelle Bachelet there were numerous charges that resulted in procedures resulting in prison for dozens of Mapuche, but over time, due to the mobilization of the Mapuche people, international reports, agreements and negotiations, many of these charges were dropped or stayed and there were no convictions under the Anti-Terrorist law. This despite the fact that between 2008 and February 2010, the Bachelet government invoked the Anti-Terrorist law in seven cases, involving a total of 54 Mapuche accused of terrorist offenses. The last occasion when the Anti-Terrorist law was used and Mapuche leaders were convicted according to this logic was in the case known as “The Ambush of Prosecutor Elgueta.” During each stage of the case all mechanisms allowed by this law were used; from the charges themselves to the judicial/police proceedings, the investigation, pre-trial custody and use of protected witness. With it came a host of judicial evidence to which the court has no choice other than to estimate test standards presented by the Public Prosecutor; documents which were mainly composed of protected witness statements, breaking every principle of due process. On the use of the protected witnesses we will not go into detail, except to reaffirm that their use violates international treaties ratified by Chile and are currently in force under international law, such as the International Covenant on Civil and Political Rights and the American Convention on Human Rights and other bodies of the UN. The use of protected witnesses has been strongly questioned because it represents an unacceptable restriction of the right to defense. It is particularly serious if the evidence or testimony presented are crucial to the prosecution’s case and a conviction may depend upon such. It is indisputable that the anonymity of witnesses expand the range of perjury, induced by possible bribery, extortion or manipulation, even buying witnesses straight. A thorough analysis is required by specialists in the field of human rights as to how the Anti-Terrorism law has operated in the various cases against Mapuche community members, especially regarding the use of protected witness, to understand its negative impact. This is essential to grasp since this judicial-political instrument, which is absolutely illegitimate and immoral on many accounts, is once again used to deal with a people who demand their fundamental rights. Once the charges are presented, the Courts empower prosecutors and police to implement all the measures and procedures that guarantee the use of the law, with powers for actions that border on illegality and impunity and lack of accountability. Always with great resources, which would even allow them to pay informants and undercover agents. Once pre-trial custody is determined, we face the “perfect terrorist reality,” with the most diverse accusations, which are the result of the prosecutor(s)’ and plaintiff’s train of thought, imposing an official speech of predetermined culpability. It is a long remand that far exceeds any given time for investigation. 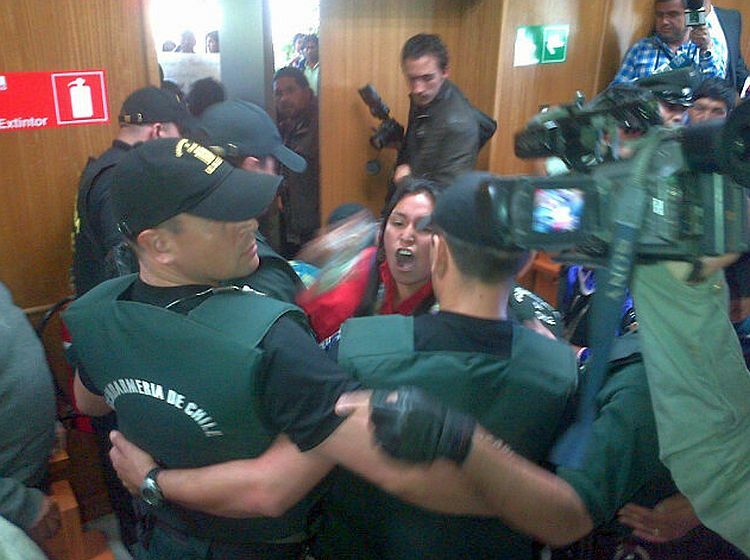 Family members react to conviction of Mapuche youth in court, Dec 5, 2013. During this period a “top-secret investigation” is established that allows for the manipulation and preparation of evidence, through the recruitment of “secret witnesses”, sampling of blood or saliva, often forcibly, scene reconstructions, etc. This evidence are always unknown to the defense of the accused. The use of secret witnesses requires the work of recruitment, through torture, extortion or payment. These are never presented spontaneously as with ordinary witnesses, instead, they are taken to Court forcefully. Specifically in the Elgueta/Jorquera case, “Witness 26,” was a Mapuche villager then later to be known as Elcides Pilquiman, a former Army reservist who worked as a private security guard, with a criminal record history. A history that was unknown to the Court during the proceedings, because he was a “secret witness”. Nonetheless, two of the judges of the Trial Court of Cañete and later the Supreme Court itself, validated his testimony as the only evidence that would result in a conviction. The testimony of “Witness 26,” was therefore the only evidence used to lay convictions against Ramón Llanquileo and myself. Oral Hearings under the Anti-Terrorism law also have the same defects. It is the result of all violations committed against due process in the previous phase, giving legitimacy to the evidence presented by the prosecution, particularly in the case where the Court can validate such evidence when it comes to determining the sentence. In the Llanquileo / Llaitul case, the testimony of “Witness 26″ was considered at all stages of the process, reaching the Supreme Court, whose expert judges rejected the veracity of that testimony in the “Elgueta Case”, lowering sentence of the leaders of the CAM to 10 years, but, strangely, validating his testimony in the “Jorquera Case”, confirming the sentence of the Court of Cañete. It should be mentioned that because the Military Court did not consider the testimony of “Witness 26″ CAM leaders were acquitted, demonstrating that there was no other evidence. With this one can conclude that the Military Courts are actually more lenient than civilian Courts. “Those who have been convicted based on the testimony of anonymous witnesses should be given the right to have their sentences be reviewed and, where appropriate, be ordered a new trial to be held under the provisions of ordinary criminal law, without resorting to anonymous evidence “. The existence of Anti-Terrorism Law is born, exists and is modernized in order to prosecute and punish an alleged internal enemy, whose existence is forcefully constructed by those who see their interests threatened. That is, it is born against anti-capitalist movements, and in our particular case, the Mapuche Nation. Unto this our position is the following: we are against the existence of the Anti-Terrorism law and we will not participate in discussions about its modification, modernization or adjustment. This law exists to pursue social movements, and criminalize their just demands. In Chile there is no terrorism, much less the Mapuche cause. It is plunder, abuse and discrimination that is the trigger of resistance against the prevailing economic and social model. Posted on August 8, 2014, in Counter-Insurgency and tagged Chile anti-terrorist laws, Indigenous resistance, Mapuche, Mapuche Chile, native resistance, repression. Bookmark the permalink. 1 Comment.